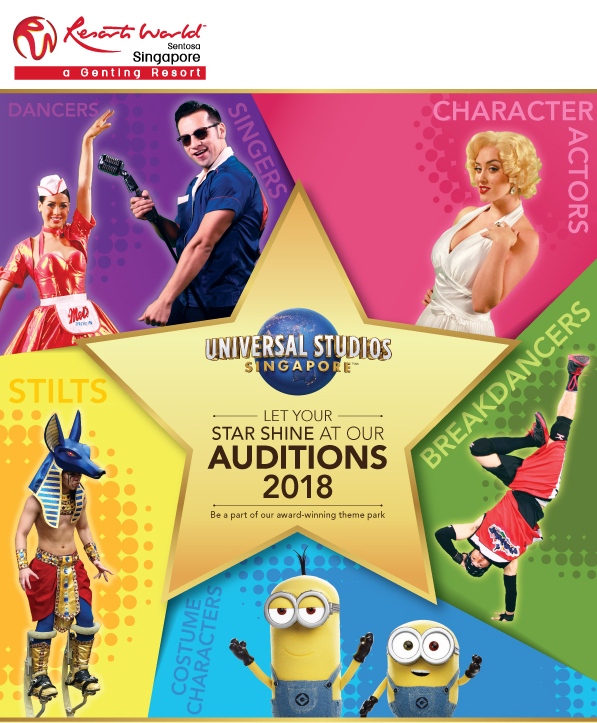 UNIVERSAL STUDIOS SINGAPORE are searching for talented Singers, Dancers, Break-Dancers, Celebrity Look-a-Likes, Character Actors and Voice Impersonators for our World-Class Entertainment offerings. VIDEO SUBMISSION FORMAT – please include ALL the following in your audition email. 1. Introduction to camera (30sec), showcasing your personality. Let us learn something about you! 2. Singing – Include singing material which is genre specific and demonstrates your vocal range. Please do NOT sing a-capella, or submit a studio recording which has been enhanced. Only performance videos and/or singing live to camera will be accepted. 3. Dancing – Please include a dance segment which showcases technical training (turns, flexibility etc. ), Hip Hop and Jazz styles. 2. Perform a short monologue in character for your chosen role, no longer than 2min. 3. Then speak to camera in character and tell us something about that character. e.g. Marilyn Monroe, and why she loves diamonds, no longer than 1min. 4. For Marilyn Monroe and Betty Boop ONLY – Please then sing in the style of your character, capturing the essence and vocal tone of the character. 2. B-BOY (required) popping, locking and tricks that you could perform on a regular basis and in multiple shows per day. ​3. If you have technical dance training or other styles/skills, please include also. Important Note: Submissions that do not follow the outlined format above will be considered incomplete.